The baseball card that I carry in my wallet depicts my lowest moment as a sports fan. The 1995 Upper Deck Baseball card shows Atlanta’s Sid Bream sliding into home with the pennant-clinching run, while sprawled- out Pittsburgh catcher Mike LaValliere reaches for the tag – in vain. The Pirates took a 2-0 lead into the bottom of the ninth inning in Game 7 of the 1992 NLCS, with their ace Doug Drabek trying to finish off the Braves to complete an improbable comeback from a 3-1 series deficit. Everything went wrong that inning for the Pirates, yet they still had a chance to walk away a winner. Until unknown pinch-hitter Francisco Cabrera singled over SS Jay Bell’s head with two outs, and LF Barry Bonds’ throw pulled LaValliere down the line, forcing him to lunge back at Bream, who represented the winning run. Bream, of course, slid in safely, sending the Braves to the World Series – and the Pirates into a tailspin. I’ve always referred to that event as “The Night Baseball Died in Pittsburgh.” Year after year, the Pirates tried to rebuild, and year after year, their attempt failed miserably. They tried different managers, and they even built a beautiful new stadium. But losing season followed losing season, until the franchise was the proud owner of a North American record of futility (19 straight seasons below .500 heading into 2012). But through it all, I have continued cheering and hoping, knowing that whenever the Pirates finally do win – it has to happen at some point, right? – It will be that much sweeter. The Upper Deck Baseball card I carry around is just a reminder. It’s a reminder that the Pirates were once good enough to compete for a pennant. It’s a reminder that anything can happen in the game, no matter how long the odds seem. And that Upper Deck Baseball card is a reminder of what a great game baseball is, win or lose. 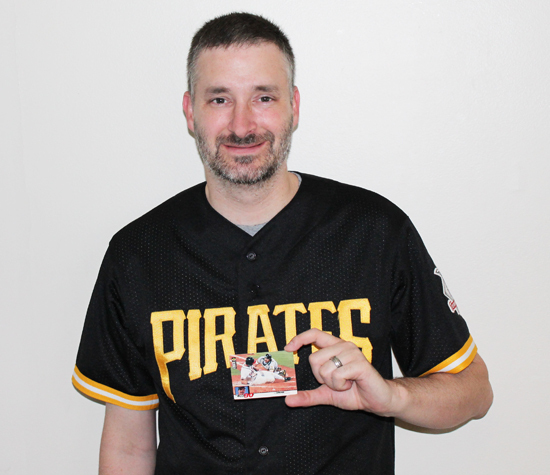 Tim Crouse still keeps an old Upper Deck Baseball card in his wallet reminding him of how close the Pirates once came to the World Series. When the Pirates finally have a playoff moment to cheer about – and it may come as soon as this season – I’ll have to find a new baseball card to carry around. Perhaps it will reflect my most cherished moment as a sports fan.